It's just a little over 6 weeks until Computex kicks off, with all the PC enthusiast hardware goodness that usually brings. This year we have had advance notice that Nvidia and its hardware partners will be launching gaming and enthusiast Pascal GeForce GTX 1000 series graphics cards before volume shipments start in July. We might even have already seen reference cooler shroud designs for two of the cards about to burst onto the scene; the Nvidia GeForce GTX 1080 and 1070. 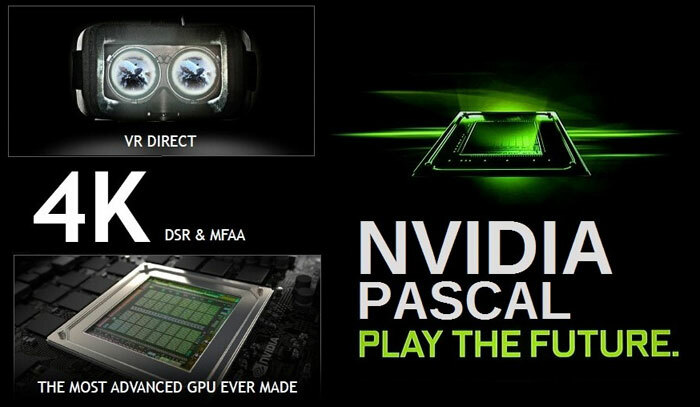 Korean PC technology site Hardware Battle has a new report about the first Nvidia Pascal graphics cards that will become available. It says that all Nvidia AiB (Add in Board) partners have now discontinued production of GeForce GTX 980Ti, 980 and 970 series graphics cards. That might simply be because Nvidia has ended supplies of these GPUs. The three aforementioned models will all be directly replaced by a GeForce GTX 1000 Series graphics card in June. According to a table published by Hardware Battle the first cards to be released will be the GTX 980Ti and 980 successors, in early June. These will be all based upon reference designs with some AiB partner surface customisations and packaging. Two weeks after the GeForce GTX 1080 / Ti launch the Nvidia GeForce GTX 1070 will arrive. This time around users will be able to enjoy the best that the AiB partners can produce using one of the new 16nm GP104 GPUs – so expect STRIX, WindForce, ACX 2.0+ and more custom cooler variations immediately. I've included Hardware Battle's product transition table, above. Gonna be interesting to see how they perform. I'm looking at buying a 70 series nvidia or 90 series amd soon to replace my aging 760, though it is still plenty sufficient to wait around a bit. If the performance difference is significant I may upgrade to this series, if not I might just wait for HBM2. My concern from the other news post still stands, this release feels a little half baked since we know HBM2 is right around the corner too, but we'll see. It's usually worth waiting until both are in the same market - early products carry a high premium that reduces quite rapidly once competition is present. How much depends on what AMD bring to the table (and what volume of cards they both bring - if low volume production then the price will stay high as they just sell what they make anyway). I'm quite excited to see what AMD will be doing - I think it's going to be quite a leap.. and they've controlled their leaks very very well this time around - just actual product demos, which is impressive. We’ve all heard about AMD’s response to the NVIDIA’s Pascal generation CPUs but not all had the chance to test the new GPUs. Luckily, we were able to get our hands on an early engineering sample of what is believed to be an AMD Radeon Polaris 10 series GPU. 10 means that the GPU is used in consoles and notebooks and in our case – a notebook. The laptop we have is considered to be low to mid-range notebook so the chances are that we are not testing the high-end model. However, it will give us a good grasp of what’s to come from AMD’s Polaris generation and how will compete in the mid-range segment against NVIDIA’s Pascal counterparts. One of the most notable features we are really excited about is the brand new GCN 4 architecture that brings tons of new features including the well-known instruction pre-fetch, which is found in the CPU industry. Along with the GCN 4, the company finally goes 14nm on its graphic chips using the FinFET manufacturing technology process. This will decrease the overall power consumption at idle and at load while limiting the leakage of current and lower heat dispersion. We are eager to test out the full potential of the GPU so expect full set of test and a full review in the coming days or week. Probably means Polaris 11 - so already in laptops.